This has been an amazing experience for me as host for this month's Sugar High Friday started way back by Jennifer the Domestic Goddess. The response has been overwhelming. Interesting note - half of you love ginger as much as I do and bake with it often while the other half rarely thought of it as an option....but that's all changed now! Check out all things gingery from soup to nuts - literally - and everything in between! All told there are over 60 entries and each one (as my favorite aunt used to say) -"To die for!" I wanted to create a spectacular visual array - slide show, flashing lights, .....but technology was not my friend this weekend so I leave you to head over to each of these spectacular entries and drool ..... So ridiculous as it seems, no photos for this post. I thought I'd start the ball rolling with mine....Five and that's not counting the two recipes when I announced the theme back in April. The first of my entries is grilled fruit with lime and ginger marmalade. But one is never enough for me, so....here are some more gingery delectables -cassata cheesecake, vanilla ginger rice pudding with dried cherries and espresso chocolate brownies with crystallized ginger. Oh and I almost forgot the gingery fruit tea loaf. But enough about me...The first entry was from Laura who decided to share her version of Martha Stewart's ginger sugared pecans, and I'm glad she did. Vineela submitted this one for ginger peanut bars that look delicious and have me sniffing the screen. Andy of Eating Leeds made this one up - yo-ho biscuits and I can't wait to try them. Georgia at Mock Tale used pears in a mouth-watering upside-down cake. Pat from Up a Creek Without a Patl borrowed this ginger lemon bar recipe and it was a big hit with her acting troupe. I can't wait to try it out myself. 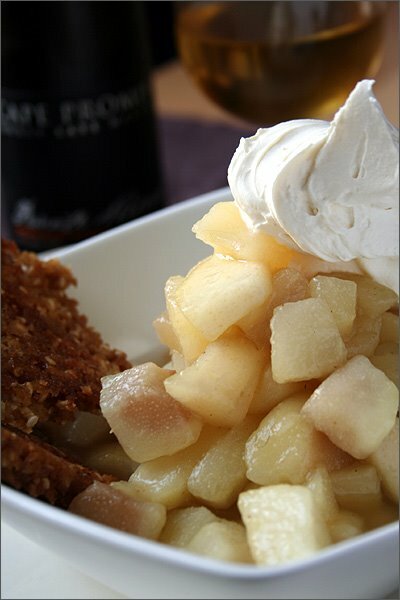 Caroline at Bibliocook sent us this great recipe for ginger crunch all the way from New Zealand. Then, from across the world in Ireland, Elizabeth of Spice Girl: if you could smell my kitchen now created a parsnip cake with ginger icing - wow! Gabriella True of My Life As a Reluctant Housewife (although with recipes like this those around her must be glad she IS a housewife) gives us a wonderful triple whammy of chunky apple sauce in her apple dumpling toast pockets topped off with an incredible ginger creme anglaise. I must admit - I've already "borrowed" the ginger creme anglaise which was a HUGE hit over berries! Kit at Cooking Debauchery sent in great read about ginger lime curd on phyllo nests with gorgeous photos to entice us. Next up is this ginger coconut burfi delight from Cascading Flavors. And even though Barbie2be doesn't like ginger, she submitted this delicious ginger apple galette. Gattina created this amazing sago pyramid with hot ginger sauce. And if you're like me, it's an introduction to a whole new food! Louise at Kitchentales suggests a wonderful picnic idea with white stilton mango & candied ginger cheese - I definitely have to check that out! JenJen at I Love Milk and Cookies sent in a perfect gingerbread recipe . Bea at Beas Kitchen submitted this yummy pear and ginger cake. Sounds like her home is a great one to drop by for tea. You have to check out Babe inthe City KL's Gingery Lychee Sorbet What a refreshing twist. And then there's the gorgeous pineapple ginger tart tatin over at Cook (almost) Anything Once. Michelle at Je Mange La Ville also used pineapples - this time in a crepe. Stephanie came up with two great choices at Dispensing Happiness (and they do!) - apple ginger pie and ginger lavender ice cream. Marie Laure of O Delices submitted these wonderful sounding lemony ginger muffins . And Ulrik of Kuchenlatein sent us another lemony ginger goody - this time it's a gorgeous snack cake. Ilva of Lucullian Delights sent us our soup - pears & ginger I'm waiting for the first really hot summer day to try it out myself. Cindy at A Few of My Favorite Things submitted chocolate and ginger checkerboard cookies. Randi at Culinary Adventures came up with East West Ginger Cake . Faith at Mekuno Cooking submitted a beautiful (and I know the perfect mid summer contribution) lemon ginger sorbet. Kat on Thyme sends us this 2 for 1 pineapple ginger upside down cake. Andrew at Spittoon Extra says he had a little trouble with measurements but the Ginger Pears with Black Sesame Butter Crunch looks great to me. This stunning coffee and walnut cake is the creation of Eric at Do You Know the Muffin Man. Chan at Lick the Spoon gives us this mouth-watering ginger ice cream with maple rum bananas. Linda treats us to an unbelievable trilogy - Ginger honey granita with liquid truffle dessert and ginger . Over at Bron Marshall's place you can try out her nanna's ginger gems . Pille at Nami Nami makes my mouth water for dark ginger chocolates and her OTT ginger & chocolate tarts . Rosie at What's the Recipe Today Jim? sent us her all time favorite dessert Orange & Ginger Tiramisu, and you can see why! Nic of Baking Sheet serves up ginger and vanilla scones - a great pairing. Emily at Appetite Behaviour may be a newbie, but check out the gingered coffee cake she came up with while in pj's and limited ingredients on hand. Virtual Frolic gives us a lessson in ice cream and highlights ginger in the process. Rebecca at CucinaRebecca read my whiny post about not doing the Delicious Magazine ginger brulee and sent us two versions of it. How great is that! Danielle at Habeas Brulee after much thought created a lemongrass saffron soda with ginger ice cream float - how very exotic! Then there's Megan of What's Cookin' who made a great ginger lime syrup over strawberries but I bet it would brighten up many a simple dessert - ice cream crepes anyone? Clare of Eats Stuff out of Sydney, Australia came up with Ginger Apple Calzones - how's that for creative! Rob and Rachel, fellow Torontonians came up with pineapple and ginger kebabs over at Hungry in Hogtown. May over at Twist and Turn created these gingersnaps a la Chey Panisse. As if ginger ice cream weren't enough, check out the Balsamic Caramel Sauce that Carolyn fro 18thC Cuisine came up with. Raspberry Sour (another Toronto blogger) at The Sour Patch, is still perfecting her ginger mousse, but it sounds good to me. And Surfindaave, even though they're all sickly sent in a fabulous looking ginger trio. Late arrival - but better late than never, Lady Amalthea didn't actually MAKE anything this time but she did share a great ginger sorbet she ate at Cones with us. Well, I for one have a very interesting and gingery summer ahead of me and now I'm off to buy an ice cream maker. Thanks to all of you for making this event such a success. Oh - interesting note (in case you actually made it this far as a read....) while taking a break yesterday, I watched a rerun episode of Simply Ming and guess what he was whipping up......you guessed it.....ginger custard that he added some sugar to and turned it into creme brulee. It looks like you had an amazing turnout! Thanks for organizing and putting together a great round-up! Wow! Now that is some round-up! Ruth-thanks for hosting the SHF and for all the work you put into the recap! Wow! wonderful job on hosting the event and the round-up! So many excellent recipes I love to try... first will be your grilled fruit with lime and ginger marmalade! WOW. I guess everyone else loves ginger as much as us. Imagine that. I can not wait to go into all the blogs and read all of the recipes. Congratulations on the great turnout and thanks for the link to EatingLeeds but I can't take credit for the biscuits. They were baked (and blogged) by the lovely Alex, my only contribution was eating them. Thanks for the kind words everyone. Couldn't have done it without all the fabulous ginger entries. Andy - nice of you to 'fess up and give Alex the credit. Lovely - do you knwo waht the next SHF is & who is hosting, cant seem to find it anywhere? Ange, usually Jennifer at Domestic Goddess gives the "next up" host link on her site under the "this month's SHF" logo. But first she leaves the current one up for a while so everyone can check it out. Great round-up. I'm also impressed at how quickly you did it with over 60 entries! Excellent roundup... I enjoyed going through all the links this morning and noted several new gingery delights to try...yum! You can't write that you have a favourite aunt. Any of them could see it! Phew - what a list of yummy ginger recipes to try out! Thanks for hosting and organising, Ruth.